The past several months have seen a very large divergence between the performance of U.S. stocks vs stocks in the rest of the world. The two main reasons that are broadly cited for poor international performance lately are that a) the U.S. dollar has strengthened and b) U.S. tariffs have created a lot of uncertainty for many countries. The U.S. dollar strengthened mainly because the U.S. is gradually raising interest rates while most other developed countries are holding their rates near-zero. The Federal Funds Rate in the United States is now about 2% and rising, while in the UK it is still under 1%, in the Eurozone it’s 0%, and in Japan it’s slightly negative. This makes it more attractive to hold U.S. dollars, because you get a better rate of return compared to peer currencies even though it’s still low. The Federal Reserve is also performing quantitative tightening now, meaning it is gradually reducing its balance sheet. The strong dollar mildly hurts the performance of international developed stocks for U.S. investors, because earnings and dividends from those countries are reported in local currencies, and it all translates into fewer dollars. But this majorly hurts the performance of certain emerging markets. This is because certain emerging markets (government and/or corporations therein) have significant debt denominated in U.S. dollars. They do this because they can get lower interest rates with dollar-denominated debt compared to their more volatile local currency, but it’s like making a deal with the devil because if their local currency falls and/or the U.S. dollar rises sharply, their ability to pay their debts becomes extremely hard. Argentina has fairly low magnitude of debt, but because much of it is dollar-denominated, and their currency reserves are small (about 8% of GDP), and their currency plummeted in value, the relative size of their debt is now much harder to pay off. Turkey has low government and household debt, but high corporate debt denominated in USD, their currency reserves are similarly small (about 9% of GDP), and their currency also plummeted. Some Spanish and Italian banks also have sizable assets in Turkey, which has put strain on them. But it’s important to keep in mind the larger picture. Argentina isn’t even in the MSCI or FTSE emerging markets indices, because it’s classified as a frontier market. Turkey is in the emerging markets indices, but only has about a 1% weighting in them. And then of course we have the tariffs. Tariffs on aluminum and steel, and tariffs against China, in particular. Chinese stocks are down over 20% year-to-date. But again, let’s look at the big picture. China’s GDP is over $12 trillion USD. China exports a little over $500 billion per year annually in goods to the United States. Even if tariffs were placed on 100% of Chinese exports to the U.S. and the impact of the tariffs were to reduce those exports by a full half (not going to happen), it would mean a $250+ billion reduction in exports. That’s 2% of China’s GDP. And their GDP is growing by over 6% per year. China has developed into an increasingly consumer-oriented economy, rather than merely the world’s manufacturing hub. But tariffs could certainly slow them down. Although China has low government and household debt, China is currently trying to deleverage its corporate sector (especially shadow banking) which has very high debt. Tariffs and the prospect of an economic slowdown are leading the Chinese government to ease up a bit on its deleveraging efforts. In addition, one of China’s potential weapons against tariffs is to devalue its currency. If, for example, the U.S. were to impose 25% tariffs on all Chinese goods, China could devalue its currency by the same amount, making goods about the same effective price for American buyers in dollar terms. This would not be good for American holders of Chinese stocks and is something to be aware of. They already let it slide from 6.3 yuan-to-USD to over 6.8 yuan-to-USD. Further currency devaluation, however, could result in further retaliation by Washington. And it would not help strengthen China’s case for increasing the yuan as a global reserve currency. China’s premier Li Keqiang (second in government after the president Xi Jinping) said last week outright that they would not intentionally devalue their currency. But this starts to get into politics too heavily. Who knows what world leaders will do. Over the long-term, I consider Chinese stocks to be a good buy currently, even if they will face volatility and potential short-term declines. I think investors looking back 5 or 10 years from now will consider mid/late-2018 to have been a solid entry point, whether it’s the bottom or not. 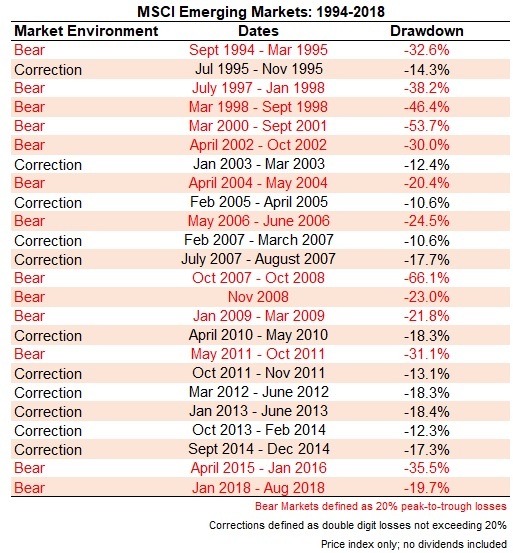 Holding U.S. stocks, international developed stocks, and emerging market stocks reduces the chance that you will have a “lost decade”, meaning a decade with basically no returns. Emerging markets became extremely overvalued in 2007, which resulted in poor returns over the decade since then. This Lazard chart shows how cheap emerging markets are and doesn’t even account for the summer-2018 dip in emerging markets, since it was compiled at the end of March. -In the early 2000’s, emerging markets were cheap by just about any metric, and gave investors great returns over the next few years. -In 2007 emerging markets were overvalued by just about any metric. Based on market capitalization to GDP, price-to-earnings, price-to-book, or compared to developed markets, emerging markets were simply expensive. And as tends to be the case for overvalued markets, their stock returns were not very good over the next decade. -Except, in 2008 during the financial crisis, emerging markets had a brief sharp dip, were extremely cheap, and a great buy. -From 2009-2013, they were moderately expensive based on most metrics. Not as bad as 2007 though. -By 2014 and since then, they became fairly cheap again because growth caught up with valuations. There were individual pockets that were not cheap, like China briefly became overvalued with a short-lived bubble in 2015. Now, after this summer’s sell-off, emerging markets are very cheap by most metrics. It looks like 2003 or 2008 all over again, after which emerging markets gave incredible returns. Emerging markets are cheap relative to developed markets, cheap in terms of historical market capitalization to GDP, and cheap in terms of price-to-earnings and price-to-book. Emerging markets have the best combo of valuation and 5-year earnings growth rates. 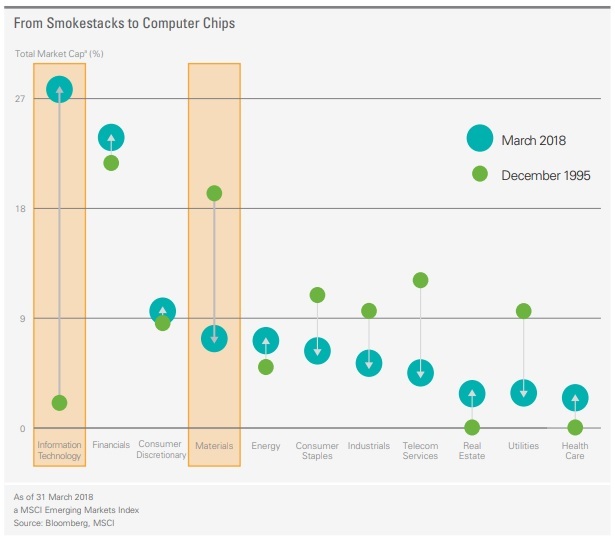 Over a quarter of the MSCI emerging markets index is in the technology sector, for example. That’s a bit higher than the U.S. and way higher than Europe. 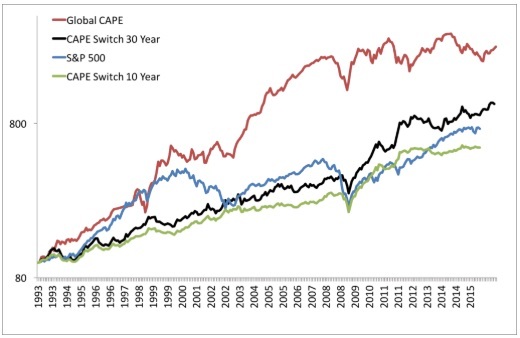 From 1993 to 2015, the S&P 500 gave investors 780% total returns, while the strategy of investing in the bottom 25% of countries based on the CAPE ratio would have given investors over 2,500% returns, or more than 3x as much money by the end. Realistically a bit less than 3x due to higher expenses and turnover. Cheap countries right now are Russia, Poland, South Korea, China, Turkey, Singapore, Spain, and a few others. Then there are others like Thailand and India that are not exactly cheap, but compared to their growth rates and fundamentals appear to be solid values regardless. 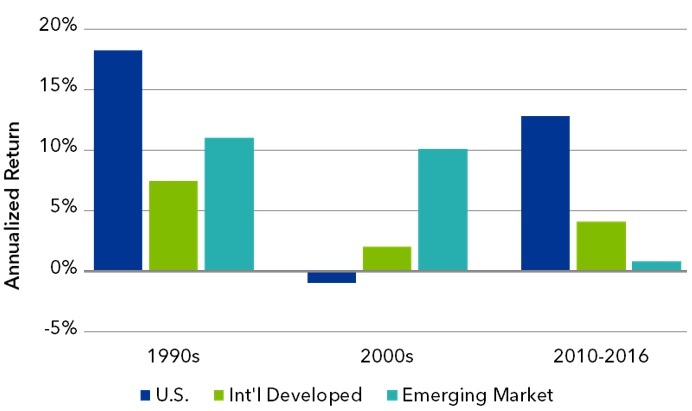 Emerging markets deserve a return premium and lower valuations because they are volatile. However, he also found that for investors that buy every time there is a 20%+ emerging market sell-off, their median one-year return is 23%, and their median five-year return is 44%. We just had a sell-off, and on top of that emerging market are unusually cheap on a fundamental basis. However, it’s important to be aware that they could go lower. It’s hard to say where or when the bottom is. Emerging markets could stay cheap for years even; there’s no law saying they have to revert to the mean within a year as they often do. I’m certainly not advocating that people go all-in on emerging markets. We don’t know what will continue to happen with tariffs, with U.S. midterm elections, with Brazilian elections, with Italy’s fiscal budget, with Russian sanctions, with China’s deleveraging efforts, etc. I’m personally using this as a time to re-balance into emerging markets. My fresh capital to my portfolios is flowing into emerging markets, because after this summer, their weightings are down in my portfolio. Occasionally re-balancing a portfolio, either by shifting around existing holdings or adding fresh capital to assets that have recently underperformed, is one of the easiest ways to buy the dips without worrying too much about market timing. And for my personal portfolio, since I have a long investing horizon and they are historically cheap currently, I am overweight in emerging markets. International developed markets (especially Japan and the Eurozone) have high sovereign debt and low or negative population growth, so I don’t weight them quite as heavily as some people do. 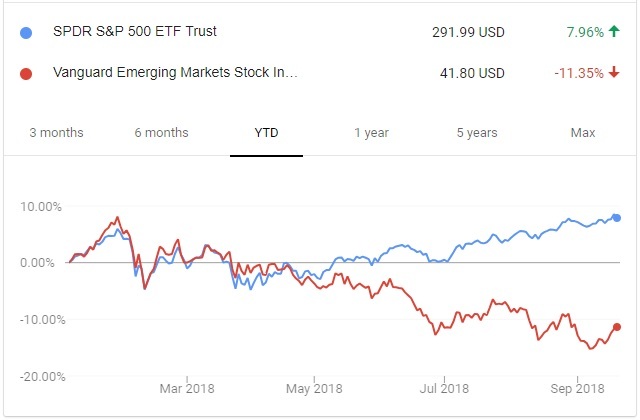 I put more money into emerging markets because the demographics and growth prospects are better, and their volatility is simply an opportunity to re-balance and buy dips rather than something to fear. You could also consider specific emerging markets if you’re a hands-on investor. They’re not all the same. Thailand has foreign currency reserves equal to over 50% of their GDP. Their economy is extremely diverse, they have a respectable balance of trade and current account, and they have solid economic growth. (It’s also lovely there; I spent a month in Thailand in December). China and South Korea both have foreign currency reserves over 25% of GDP. Russia has them at almost 30% of GDP. Taiwan has them at a whopping 80% of GDP. Compare this to Argentina and Turkey whose currencies tanked, both with foreign reserves below 10% of GDP. Currency reserves are one of the main tools to keep a currency stabilized, because a central bank can sell some reserves and buy their own currency in response to weakness in their currency. This is a good time, I think, to have a portion of a portfolio dedicated to broad emerging markets. Or more specifically for hands-on investors, to countries with limited external debt, decent currency reserves, and reasonable valuations compared to their fundamentals and growth rates. Although this newsletter issue focused mainly on the divergence between U.S. equities and the rest of the world, there are a few other things worth briefly highlighting. Silver is now quite cheap. It has been reasonably inexpensive over the last two years or so but has drifted steadily downward. It hasn’t been this cheap in terms of its inflation-adjusted price since 2009. And interestingly, the silver-to-gold ratio is unusually high at 83-to-1. Over the past century it has averaged about 50-to-1. Only two times in history has silver been this cheap relative to gold, and that was in 1940-1941 and 1990-1995. Silver is a precious metal, but as the world’s most conductive metal it is also heavily used in electronics and solar panels, and has uses in medical supplies as an anti-microbial. Due to corporate tax cuts, U.S. corporations are performing record share buybacks. The previous record year was over $800 billion in buybacks in 2007, but corporations are on track for $1 trillion in 2018. A lot of this is a one-time event, because it’s heavily due to cash repatriation. Companies in the U.S., especially the tech giants, were able to bring hundreds of billions of dollars back to the United States after years of accumulation and tax-avoidance overseas. All else being equal, this should prop up the S&P 500 for the rest of the year, although we may have some volatility around the midterm elections, or if third-quarter reports show a slowdown in earnings from tariffs or other factors. I wouldn’t be surprised to see a strong November/December for 2018. But in 2019 there will likely be much less capital for buybacks, which means slower EPS growth and more opportunities for a market correction. Who knows though. Anything can happen. 7th Inning of the Cycle? Ray Dalio, the founder of the world’s largest hedge fund, gave a few interviews in the past few weeks to CNBC, Bloomberg, and other media. He’s personally worth $18 billion and back in 2007 he was warning about excessive leverage and the upcoming crisis, and did very well for his firm through it. Worth highlighting is that he considers us to be in the “7th inning” of the U.S. economic cycle, with perhaps two years to go before a recession. Most of his indicators are “flickering” but not yet “flashing”, as he puts it. Corporate debt is high, interest rates are rising, asset prices are high, unemployment is already low, the yield curve is flattening, etc. I tend to agree with his view. For example in the previous newsletter issue I highlighted corporate debt levels, as well as a variety of recession indicators. The results show that many fundamental late-cycle elements are building but not yet imminent. While predicting the timing of economic cycles is hard, it’s useful to be aware of roughly where we likely are in it. And it’s worth knowing that usually the stock market peaks several months before a recession begins. Value funds in general, both active and passive, have noticeably under-performed growth funds in recent years. 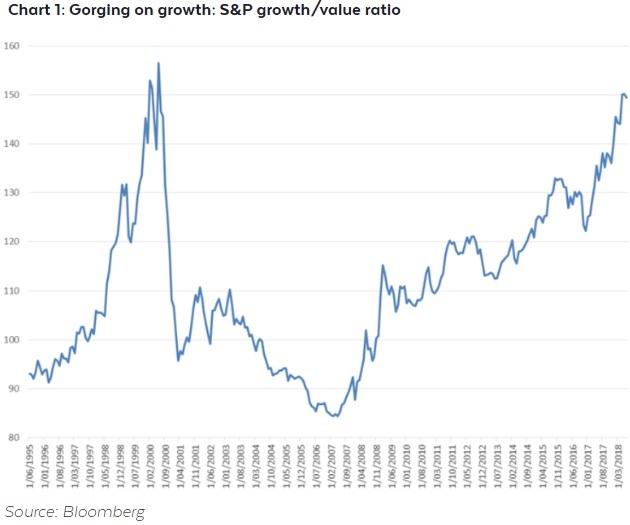 Some people think this means we’re ready for mean reversion, where value stocks will once again outperform growth stocks. I think that may happen to some extent, but it pays to be cautious about assumptions. Unlike the Dotcom Bubble, many large tech companies today are making tremendous revenues and profits. Many of them have beautiful balance sheets with tons of cash. And technology is indeed playing a bigger and bigger part in our lives compared to old-world stocks. The way investors measure value (especially as it concerns book value) may be becoming outdated, because technology companies can produce tremendous returns on little capital invested compared to asset-heavy industries. For me, it’s really about individual stocks at this point, rather than the broad theme of growth vs value. I do think many high-quality banks, energy pipelines, insurers, and REITs (aka “value stocks” generally) are at reasonable valuations. Many of them pay solid dividends and are well-positioned for economic downturns. As we get into what is likely the later stage of the economic cycle, it’s these high-yielding companies with good balance sheets that are not at multi-year highs that interest me the most. On the other hand, something like Netflix with a price-to-earnings ratio of 150 and a 300% stock price gain in three years is a bit spookier to hold in my opinion at this point. It has about the same market capitalization as Disney, but with a quarter of the revenue and a twelfth of the profits, albeit with faster growth. 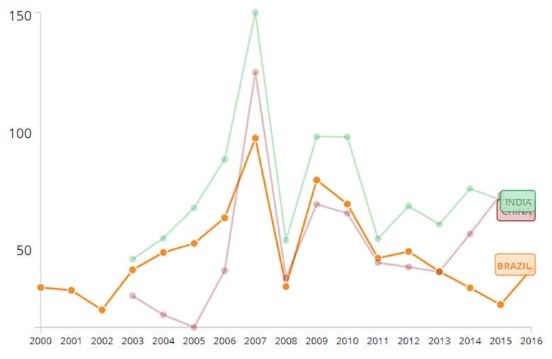 That kind of valuation gets a lot of scrutiny during economic downturns. REITs were overvalued in 2016 but came back down to earth about a year ago. Blue-chip pipeline companies like Enbridge (ENB) and Enterprise Products Partners (EPD) were overvalued several years ago as well before the energy price crash, but at today’s prices seem to offer solid forward returns from a combo of high yields and modest growth. 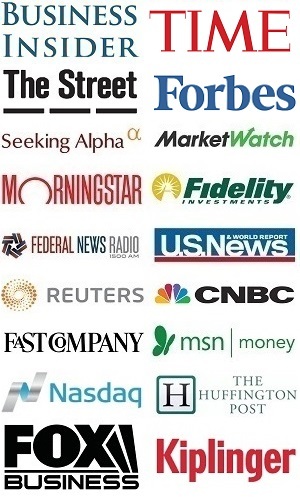 For this newsletter issue I am introducing a real-money newsletter portfolio that I will track each issue. I have a primary retirement account, a Roth IRA at Fidelity, and a taxable investment account at Schwab. This month, I opened up a fourth account at M1 Finance which will serve as the portfolio I highlight in detail in each newsletter issue. I started it with $10,000 in fresh capital on September 12th, and will add $1,000 to it each time I publish a newsletter issue (which tends to be every 6 weeks). This is of course on top of my contributions to my other larger accounts. 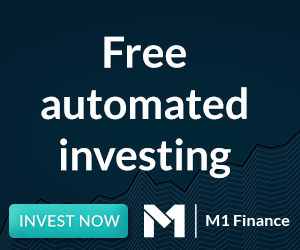 The reason I picked M1 Finance is that it’s totally commission-free, and allows people to construct portfolios made of ETFs and/or individual stocks that are very easy to re-balance, either by adding fresh capital or by clicking the “re-balance” button. 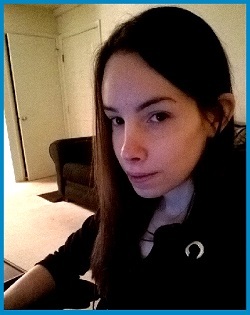 My design here is meant to be a simple, diversified, and self-contained portfolio. -The portfolio is overweight emerging markets, because I see long-term value there and don’t mind the volatility. 35% of the portfolio is in the “International Equity” pie, of which 60% is emerging markets, meaning 21% of the full portfolio is in emerging markets. 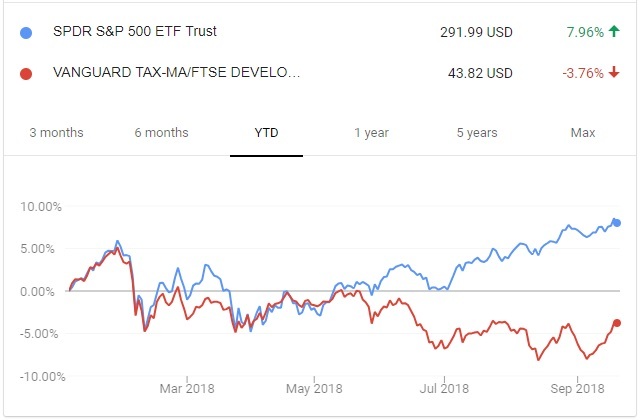 -Including the U.S. total stock market ETF, the real estate ETF, and 70% of the dividend stock pie, about 24% of the portfolio is invested in U.S. equities. -The dividend portfolio is 25% invested in Brookfield Asset Management (BAM) and Enbridge (ENB), two high-conviction picks of mine. 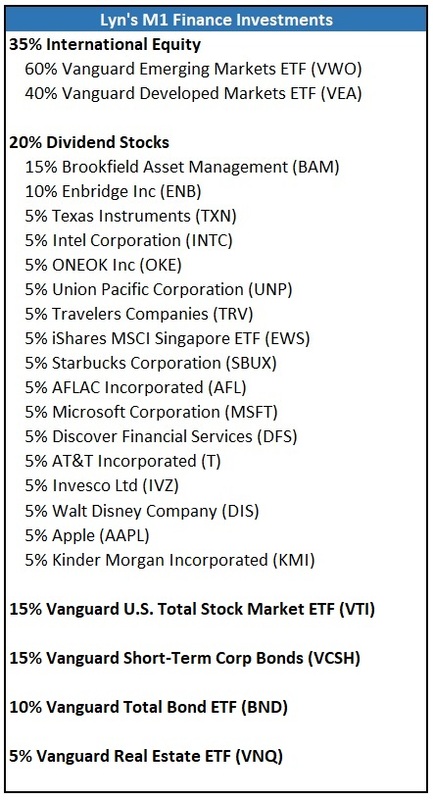 The other 75% is equal-weighted among 15 other companies, mostly in the infrastructure, technology, consumer, and financial industries. -One of the equal-weight dividend stock slots is actually a Singapore ETF, which pays a yield over 4% and is attractively valued, and mostly consists of banks and industrials. You can read my thoughts about Singapore from last year here. I plan to publish an update about Singapore in the coming month (I’m quite bullish, after this year’s international sell-off). -A quarter of the portfolio is in bonds. I prefer short-term corporate bonds (15%) in this rising rate environment, but 10% is also in a broad bond index. This is mainly a buffer because U.S. equities are expensive. -I may at some point sell some bonds to increase my international equity allocation by 5% or put 5% in precious metals. 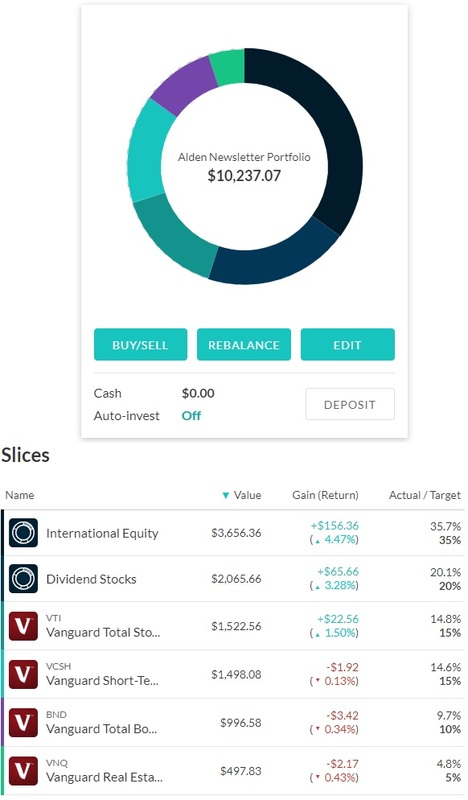 I have a primary retirement account with an employer invested in index funds that is currently 40% U.S. stocks, 20% international stocks, and 40% cash and short-term bonds. It was almost 90% equities for 2009-2016, but starting in 2017 I shifted it to be more conservative. -I sold December $20 cash-secured put options on Sierra Wireless. This is a pure-play Internet of Things (IoT) company that has had a rough time but appears to be turning a corner into profitability as it shifts towards higher-margin cloud software with recurring revenue. -My SunPower $8 puts expired slightly in the money and were assigned on Friday. I’ve been making a lot of money selling puts on this company, which is volatile but with the best product in industry (the highest-efficiency commercially-available solar panels in the world). Now I hold SunPower and will likely sell out-of-the-money covered calls on it. Read more about SunPower and Sierra Wireless on my Equities.com profile if you’re interested. 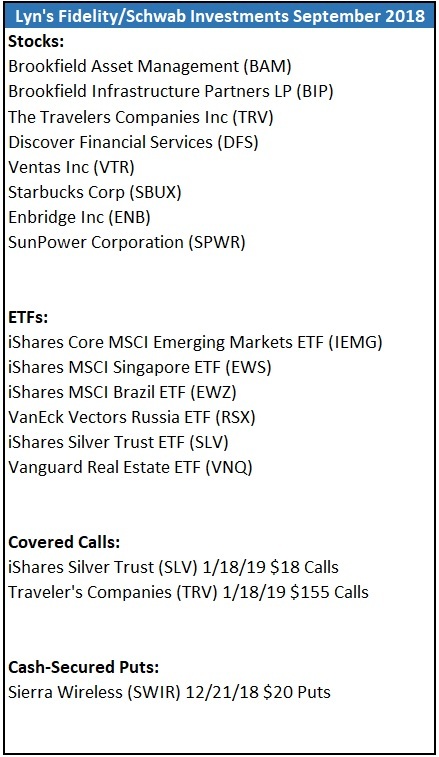 These are more speculative with high potential rather than proven, so I keep them to a small portfolio allocation. They are both up 10-20% since I wrote those articles a couple weeks ago, but I still think they are reasonably priced. For me, investing is mostly about balance rather than big moves. International stocks and in particular emerging markets seem to be offering attractive entry prices for the long-term, whether or not there is more short-term pain and volatility ahead. I’m using it as an opportunity to re-balance, and if valuations get even better in the future, I’ll re-balance with additional fresh capital. Volatility is an opportunity rather than a problem. Value stocks with decent yields also interest me, and I’m invested in infrastructure companies like Enbridge (ENB), Brookfield (BIP), Oneok (OKE), and the modern self-funding Kinder Morgan (KMI). I’m also bullish on Enterprise Products Partners (EPD) and certain other businesses. The next newsletter issue will come out around early November. I plan to focus that issue on debt. Government debt, corporate debt, and household debt.